(second of a two-part post). In early 2009, in the midst of several consulting projects, I started the initial research into this idea of a web site that preserves family history. I spent four months thinking through the idea: sketching out a rough draft of the features, what it might look like, the market size, who the competition was, the team I’d need to make it happen, how much money, a brand name, and a lot more. I openly discussed the idea with friends and fellow entrepreneurs and 100% of them said they liked the idea and thought their family would use this product. When I looked at what we could create that would separate us from others, there were several aspects that would be unique. Other companies were focused on four main areas including, researching your ancestors (Ancestry.com, FamilySearch), memorializing loved ones (Legacy.com, Tributes.com), social networking for families (MyHeritage, Geni) and family tree creation (RootsMagic, Family Tree Maker). No one took a Wikipedia-style approach – a site that is created and edited by the community, truly collaborative, openly accessible, free to use, and meant to endure for future generations. And no one focused on sharing stories. Everyone is interested in their family history and genealogy (one’s lineage) is a part of your family history. But the most compelling parts of one’s family history are the life stories of your ancestors, their pictures and how others were impacted by their life. If we could start capturing the stories of human-kind this would evolve into an amazing resource for future generations. This was the void in the market. In May of 2009, I decided I to focus all of my efforts on developing this idea into a product. Until I could figure out a name, we called it FamilyWiki. For the next year, as a student of genealogy and online collaboration, I went to genealogy workshops, visited genealogy libraries, went to a lecture by Jimmy Wales (founder of Wikipedia), had dozens of breakfasts with potential investors, web developers, college professors, other entrepreneurs and read hundreds of magazines, newspapers and blogs. I fully immersed myself so that I could answer any potential objection or question about the business. Without the money to hire a team, my highest priority became finding investors that believed in me and my vision. In 2009, the NASDAQ was near a 7-year low which made raising money a difficult proposition. But having been involved in many start-up businesses, I knew this is a product that would create enduring value. The process of raising money is probably worthy a post all its own, but In May of 2010, eight individuals for whom I am most grateful to, provided the investment capital to create GenerationStation. 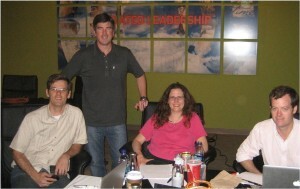 On May 25, 2010 we kicked off our development effort and six months of full development ensued. The team discussed, debated and obsessed over every word, pixel, and user-flow. In late November, we invited family and friends to start using the site. While simultaneously continuing development and inviting more and more people into the private beta, we gained valuable feedback. We continued to tweak the site and make improvements each day, and by March 2011 it was apparent from the member feedback that the site was ready for public beta. The void is filled and people are really enjoying GenerationStation. Seeing their lineage come to life through stories and pictures is proving to be a positive experience. The esteemed broadcast newsman, Tom Brokaw, called those born in the 1920’s, the Greatest Generation. These men and women spent their childhood years in the midst of the Great Depression, (25% unemployment and 89% drop in the stock market). They put their lives on hold and volunteered their services to fight in World War II. My father, John A. Dowdle was part of the Greatest Generation and now his story is preserved. 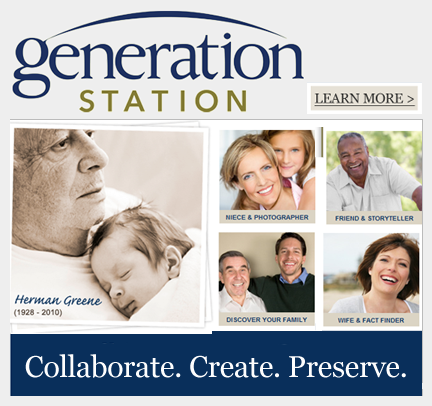 I hope you will preserve your family’s story for future generations to discover and enjoy on GenerationStation.